"Roger Schult est un petit fabricant qui sâ€™est tout dâ€™abord illustrÃ© avec lâ€™UF1, un Ã©galiseur cinq bandes au format rack, trÃ¨s coÃ»teux mais proposant une grand nombre de fonctions parfois inÃ©dites. Ces modules W2377 â€“ disponibles en trois version : low, mid et high band â€“ proposent au format 500 des bandes frÃ©quentielles du grand frÃ¨re UF1. Et bien sâ€™avÃ¨rent Ãªtre chacun une vÃ©ritable bande dâ€™EQ. Lâ€™ensemble des six modules au format API 500 est prÃ©sentÃ© comme un correcteur de timbre multi-Â­bande stÃ©rÃ©ophonique : trois modules de correction diffÃ©rents pour chacun des deux canaux. Ce nâ€™est quâ€™une vue de lâ€™esprit car lâ€™indÃ©pendance de chaque module permet intÃ©ressantes. Vous pourrez donc construire simplement(...)"
"Roger Schult had a very interesting idea. His mastering equalizer, the UF1, which he calls an Aural Editing System for Mastering Environment, has been getting rave reviews from the few people lucky enough to get their hands on one. However, at a price point of â‚¬10,399 EUR, it's a little tough for many people to afford. In order to give his designs a little more breadth, he decided to package the filters individually as 500- series modules. The complete W2377 system is essentially an API 6-space lunchbox with two high-frequency modules, two mid, and two low. With a little patching, you have one of the most delicate 3-band stereo equalizers I've ever heard. At first, while using the system as a mix-bus EQ on a new White Bike Soundsystem track, I found the setup a bit awkward. I'm not a fan of unnecessary cable runs, and even with short cables, there was about 2 ft of slack between each filter. It wasn't until I took it off the full mix and separated the channels out to the patchbay that I started to have some fun with the design. My initial impressions were (...)"
"Employing a whopping three Lunchbox modules per channel, this EQ system may not come cheap â€” but it boasts some impressive features. Modules are linked via a staple-like connector that fits into the front panels.Modules are linked via a staple-like connector that fits into the front panels. The RS Audio Technique W2377 filter modules, to give them their full title, are available in three versions: low-band, mid-band and high-band, covering the continuously variable frequency ranges from 20-730 Hz, 155Hz to 3.5kHz and 1.03-23.2 kHz, respectively. In all other ways the modules are..."
+++ 2010 Juli - Testbericht in Xound "drei Engel für Charlys Mix"
Das Audio-Labor von Roger Schult hat seine Produktpallette um eine neue Filter-Serie für das api 500 Format erweitert. 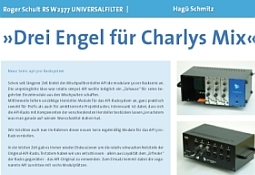 Die renommierte Universalfilter-Serie des UF1 wurde damit um drei neue Produkte ergänzt. Damit stehen nun drei Filtermodule Low, Mid und High zur Verfügung. 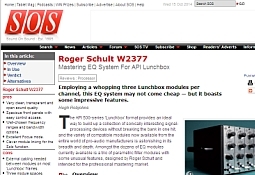 Getestet haben wir die neuen Roger Schult EQs in einer sogenannten API Lunchbox, die neben dem Racknetzteil weiteren sechs 500er-Modulen Platz bietet. Alle Anschlüsse des Racks befinden sich auf der Gehäuse-Rückseite. Hier hat jedes Modul seinen eigenen symmetrischen XLR-In und XLR-Out. Dies hat den Vorteil, dass man die drei EQ-Module auch völlig unabhängig voneinander einsetzen kann. Möchte man dagegen das komplette EQ-Trio am Start haben, so empfiehlt sich, die drei Module mittels kurzer XLR-Kabel einfach in Reihe zu schalten. Wie gewohnt wählt Roger Schult bei den neuen EQ-Modulen einen Aufbau mit gravierten, Alu-verchromten Frontplatten und qualitativ hochwertigen Komponenten, wie ..."
Fab Dupont testet bereits zwei Monate nach Entwicklung die neuen W2377 api® Filtermodule. Ausführlich bespricht Fab Dupont im Interview mit Janice Brown von sonicscoop die Vorzüge der W2377 und vergleicht diese mit dem GML9500 von George Massenburg Labs. 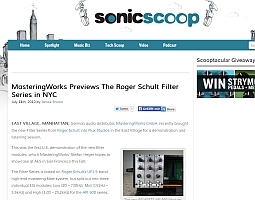 EAST VILLAGE, MANHATTAN: German audio distributor, MasteringWorks GmbH, recently brought the new Filter Series from Roger Schult into Flux Studios in the East Village for a demonstration and listening session. This was the first U.S. demonstration of the new filter modules, which MasteringWorksâ€™ Stefan Heger hopes to showcase at AES in San Francisco this Fall. The Filter Series is based on Roger Schultâ€™s UF1 5-band high-end mastering filter system, but split out into three individual EQ modules: Low (20 â€“ 730Hz), Mid (155Hz â€“ 3.5kHz) and High (1.03 â€“ 23.2kHz) for the API 500 series. Together, the Filter Series is known as the RS W2377 API 500 Module, and can be mixed-and-matched or bought as a three-module filter system for recording, mixing and mastering applications. 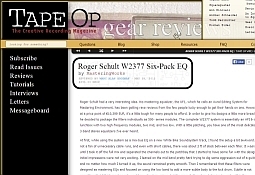 The Filters offer a solo function if more than one EQ is in use, a focus switch for quickly locating wanted or unwanted frequencies and a hard bypass function..."
Review about Roger SchultÂ´s 500 Series EQ Filter W2377, containing overview- / in use- / conclusion-section. Published by Chris Wilson on gearslutz.. While a stepped ELMA switch is used to set the Quality control, the Frequency and Level settings use ALPS potentiometers. The Level potentiometer has a center detent and covers a range of -10dB to +10dB. 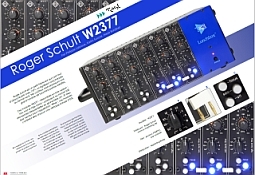 For some mastering engineers, the non-stepped potentiometers of the W2377 will not be ideal, but for anyone not requiring stepped gain and frequency settings, the versatility of this modular design opens up new and interesting workflow possibilities. Frequencies and gain settings are very clearly laid out on the engraved faceplates so recall has presented no challenges for me thus far. The W2377 filters have nine different Quality (Q) settings from very broad to very narrow. Either end of the Q rotary switch can be set to engage a frequency adjustable high-pass or low-pass filter. The lower Q settings (0.3, 0.5, 0.7) are quite broad and are excellent as an adjustable slope shelf-like filter. The EQ curves bell more in the mid-level settings (1.0, 1.5, 2.5) and finally go from a gentle to steep notch (4.0, 6.0, 10.0) with the high-pass and low-pass functions at either end of the dial. The high-pass/low-pass filter has a slope of 6dB for the first octave then 12dB per octave thereafter. The illuminated buttons at the bottom of the module are the Focus, Solo, and Bypass options. The Focus button inverts the Level setting of a module to reference the selected frequency range. For example, a level of +3dB becomes -3dB (Q is unchanged) when the Focus button is engaged. To my knowledge, this is a unique feature to Roger Schult's designs. A peculiarity of hearing is that it's easier to isolate amplified frequencies then attenuated frequencies, so the option to switch back and forth instantaneously is a real luxury. This feature has been unexpectedly handy in tracking down and treating "ringing" notes quickly. Turn the gain up, sweep the frequency until you find it, invert the gain, make a decision about how it sounds, make a small adjustment, done. I have come to really appreciate the immediate referencing ability of this function over turning the level knob from + to - back and forth. The Solo function isolates a selected module by engaging the bypass in connected modules via a signal bus on the front panels. The Off switch engages a true bypass by means of relays. While I spend plenty of time with two sets of three filters linked together to make a regular style parametric EQ, I have found numerous uses for single bands, or combinations of filters. For example, this modular design was helpful recording a ..."